Our brain is a mysterious machine. Billions of nerve cells are connected such that they store information as efficiently as books are stored in a well-organized library. To this date, many details remain unclear, for instance the set of rules that governs the connections between nerve cells and the organization of information therein. An international team led by scientists of the Max Planck Institute for Dynamics and Self-Organization in Göttingen has now shed new light on these long-standing questions and found that networks are not governed by randomness. Some scientists considered this possibility for the organization of the brain, because randomly connected networks work well in computing applications. To test the random wiring hypothesis, the team examined whether the brain is using random connections to process visual stimuli. To this end, they calculated predictions that rely on the random wiring hypothesis and compared the results with precision measurements of the cortical architecture in various mammals. The result: random connections do not suffice to explain the observed layout of the brain. The scientists conclude that initially random connections in the visual cortex are reorganized to a precisely determined layout using self-organization. Random wiring, in the end, plays a small role. Randomly wired? A fluorescence microscope reveals the largely random network, that neurons form in a culture dish. 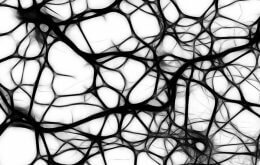 An international team of scientists, led by researchers from the MPI for Dynamics and Self-Organization, investigated whether nerve cells in the brain wire randomly. Nerve cells in the human brain are densely interconnected and form a seemingly impenetrable meshwork. A cubic millimeter of brain tissue contains several kilometers of wires. A fraction of this wiring might be governed by random mechanisms, because random networks could at least theoretically process information very well. Let us consider the visual system: In the retina, several million nerve cells provide information for more than 100 Million cells in the visual cortex. The visual cortex is one of the first regions of the brain to process visual information. In this brain area, various features as spatial orientation, color and size of visual stimuli are processed and represented. The way information is sent may be comparable to a library, in which books can easier found if they are sorted not only alphabetically by title, but also by genre and by author. In a library, books are spread to different shelves, but typically not randomly. Similarly, various facets of visual perception are represented separately in the visual cortex. And the organization of this representation might be random. Mathematical modeling suggested that randomly distributed information is very well suited to separate features, in fact, better and better the more features are concerned. “Two years ago, neurobiologists showed the existence and relevance of random connections in nervous systems for the olfactory system of the fruit fly” explains Manuel Schottdorf, scientist at the MPI for Dynamics and Self-Organization. Whether the brain of mammals takes advantage of random connection schemes, or whether its networks form self-organized has been unclear and disentangling the cable spaghetti is still out of reach. Thus, the team of Max Planck scientists lead by Fred Wolf together with colleagues from the Rockefeller University in New York and the Duke University in North Carolina used alternative methods: The scientists analyzed the functions of the circuits in the visual cortex and deduced their structure. Neurobiologists know that nerve cells in this area of the brain process, among other things, the orientation of edges of objects. Every cell prefers a different orientation of such an edge, for instance oblique or cardinal. Exceptions are singular points, so-called pinwheels, around which the preferred orientations of the cells are arranged as the winglets of a pinwheel. The scientists from Göttingen calculated the number and distribution of these points, that would result if the random wiring hypothesis was correct. They found that these predictions disagree with the observed distribution of pinwheels, which the scientists derived from precision measurements conducted by experimentalists from Duke University. Among others, the scientists observed that in a certain volume of nerve cells, there are fewer pinwheels than the random wiring hypothesis predicts. Thus random connections along cannot account for the observed pinwheel layout. Distinctly, models, in which these layouts form through self-organization predict both the number, and the complex spatial arrangement very precisely. The scientists do not exclude the possibility that in early brain development, random connections might play a role. But through visual experience and dynamic reorganization of connections, the brain rewires itself to such a degree that only little is left from the initial wiring. “Our study shows that self-organization of neuronal circuits in the brain is the most plausible theory for the detailed structure of circuits in the visual system” explains Wolfgang Keil, who graduated from the MPI for Dynamics and Self-Organization and is currently working at Rockefeller University. This result is consistent with the observation that mammals, including us human beings, learn to see after birth. Random networks, which might exist early on, probably do not suffice for full vision.